What a slow week for me... It must be the heat. Even with air conditioning it makes you sooo lazy. It reached over 100 degrees here this week. I saw one time/temperature sign show 105. Whew... that's hot! When it gets hot like this you'll hear us saying in our home, "God Bless the person that invented air conditioning". I managed to sew two Farmer's wife blocks this week. 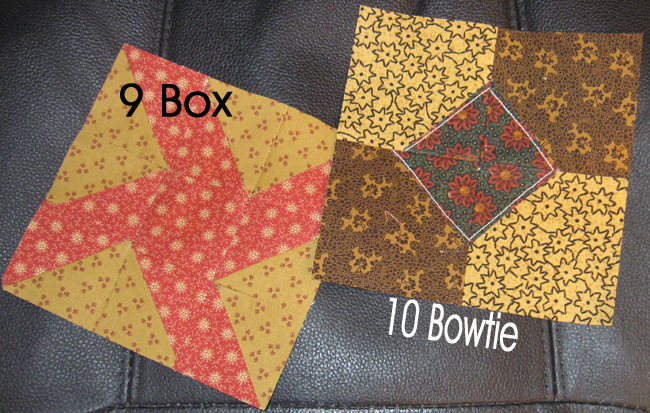 They are blocks 9 - Box and 10 - Bowtie. I'm not crazy about the color combinations but when they are all together, I'm sure they will all blend in.